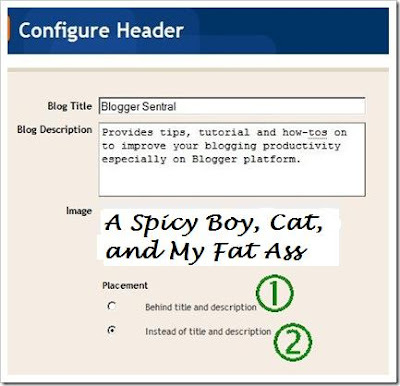 If you uploaded your header image via Page Elements, Blogger will automatically align it to the left. There are no options for middle and right alignment. So then, it possible to align the image in at the center or to the right of the header? Yes it is possible -using CSS (Cascading style sheet). But to define a HTML element in CSS you must first know the element ID or class name. After some checking I found out that “header-inner” is the ID for the content of header widget. So what’s next? You need to check the image placement method you chose when you uploaded the header image to Blogger in the first place. Different method handled the image differently, thus requiring different codes for alignment. 1. Once header image placement is known, it’s time to add in the code snippet. Update: Now, instead of the steps above, there is an easier and safer way of adding CSS snippet in your template (opens in a new tab/window). Check it out! Below are a list of CSS code snippets for you to choose from. Copy and paste them as explained above. Use only the first line for normal Layout template. Use both lines if you are using Template Designer. You need to adjust the left margin (300px in this example) to “push” the image to the right. Adjust the value until you get the desired position. For option 1 and 2 to work, your header image width (plus margin and padding if any) must be equal or less than the container (such as header-wrapper, outer-wrapper etc.) width. The snippets below are for aligning header title and description. They will work with both text-only header and the text in “Behind title and description” image placement option. Adjust the value until you get the desired position. For the description, use .descriptionwrapper. Use one of these if you want split the header into two parts -an image and a text parts, positioned side by side. These snippets are only applicable to “Behind title and description” image placement option. Increase left padding to push away texts to the right the header image. Increase right padding to push away texts to the left of header image.